Jun 21, 2017 Thank you for taking the time to share your experience on partnering with 50 Floor for your flooring needs. 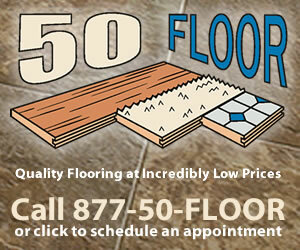 We understand that you’ve had some inconveniences with your floor installation. We look forward to addressing your floor matters by first scheduling a quality assurance manager and general manager to visit your home to assess areas of concern. We understand your appointment is now scheduled. Thank you for choosing 50 Floor and sharing your experience. This company is not a company of honor or integrity. I paid an arm and leg for what I thought was quality wood, carpet, padding, and vinyl flooring but no longer sure that is what I received. There have been so many issues and the "fixes" have created more issues. The floating floor in my laundry has made my HE washer vibrate all over the place and no one seems interested in fixing the issue. I have had a washer repairman out and there is nothing wrong with the washer. Phone calls are not returned and empty promises are dished out. There is a raised seem area in my carpet which I distinctly told the installer I did not want to have. Of course, he assured me there would not be. Because of all the issues, I was told that compensation was due me. Another empty promise. Review #1055327 is a subjective opinion of User1055327. I wouldn't even give them 1 star. EVERYONE there lies, ignores calls, never returns calls, etc. They just lie to cover each other. They don't even know their own fax #! 1 says they rarely get faxes, 1 says their fax is always busy. They can't keep their lies straight. This seems to be the norm with this "business". They delivered what they insisted I ordered. They then tried to talk us into the incorrect flooring- saying it matched our home better! Keep your opinions to yourself!